SWAT is the exclusive stockist of a superior range of specialty food production additives. SWAT stocks yeasts, enzymes, malolactic cultures, oak alternatives, tannins and grape juice concentrate. These superior products are all suitable for your specific wine, beer and cider making requirements. Please call in and see the fantastic range readily available for you today. AEB is a leader in oenology and biotechnologies andoffers a wide range of products supplying winemakers with the most advanced wine processing and treatment techniques. Product range includes yeasts, enzymes, bio-regulators and nutrients, gum Arabic, tannin and many other wine making products. View all AEB products. CHR Hansen is a global supplier of bioscience based ingredients to the food industries. Their range of innovative yeasts and bacteria have been developed to meet the requirements and needs of todays winemakers. Have a look at our range presentation, fridge and freezers with stocks and product information readily available. View all CHR Hansen products. We stock a fantastic range of premium oak products. The forward thinking Evoak range represents innovations in design, toasting, measurement and packaging of the finest French and American oak. The innovative oak tannin range Trutan is another unique product available to the winemaker. The blends of gallo and ellagic tannins are designed for use at different stages of winemaking. We have available product information, samples and stocks ready for your winemaking needs. View all Oak Solutions Products. Check out the evOAK Oak Usage Calculator. Premium neutral white grape juice concentrate is available from our fridges in 20 litre containers. specialise solely in wine, food and beverage hygiene maintenance. Check out the Aird Range & Data Sheets. 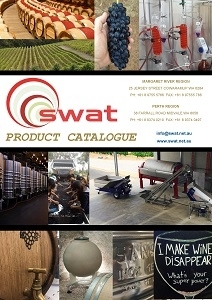 SWAT also stocks the complete range of winery chemical consumables. Please phone, email, fax to get the complete range in stock now. For most products on this page MSDS’s can be found here.